Feel the tetrominoes calming, soothing nature! Tetris can be quite the competitive, blood flowing inducing, stressful and very energizing game, but, with a very few ideas changed, with a more Zen like look and with music that will sooth and calm you, you can transform this experience into one that even a Zen master would be proud to sink into! 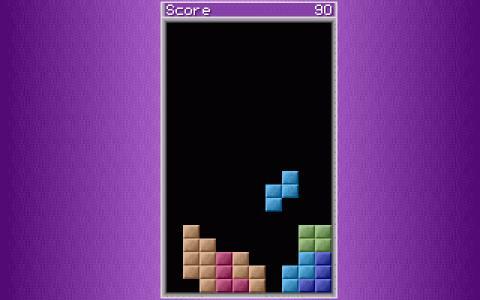 Now, the gameplay of any original Tetris game is still there: tetrominoes fall from the sky, at random and you have to arrange them in such a way as to form uninterrupted lines of tetrominoes. Form, 1, 2, 3 or, if you're lucky, 4 lines and you get points. After a while, in a classic game the speed of the tetrominoes that enter the play field would increase, in rather hefty increments. Not here though; while the speed of this game does increase, it doesn't increase by doubling the previous speed, it's a much more lenient forward push. That, coupled with Zen 8bit sounds and a purple background makes this game here a reputable, well produced, always exciting game, one that you'd be happy to play when you need to chill for a moment. So, definitely, worth the download!